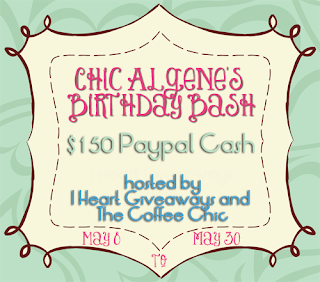 It's Chic Algene's Birthday on May 8th and she will be having a very special $150 Paypal Cash Giveaway, but she is looking for BLOGGERS to participate! I enjoy celebrating birthdays and will be apart of this very special event! You should too! 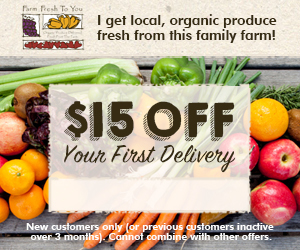 To ADD YOUR BLOG and Celebrate with US, CLICK HERE! 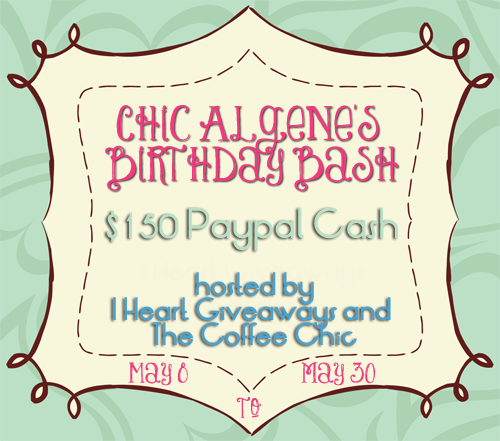 Beginning next month I will be participating in an AWESOME blogger Event! I enjoy putting smiles on people's faces and this one will sure do that for any lady looking to WIN one of these prizes! Prize: Butler Bag (RV$215), Odyssey Cologne Spray, Odyssey Roll-On Anti-Perspirant Deodorant, Odyssey Perfumed Skin Softener, RARE DIAMONDS Body Lotion, RARE DIAMONDS Shower Gel, RARE DIAMONDS Eau de Parfum Spray, SKIN SO SOFT Signature Silk Moisturizing Shower Gel, SKIN SO SOFT Signature Silk Gelled Body Oil, SKIN SO SOFT Signature Silk Replenishing Hand Cream, Florence Gift Set, Leading Love 2-Piece Gift Set, Silver Coin Purse, Black Wallet and $50 cash to fill it with! If you are currently a blogger then I would join me in signing up! The What Women Want Blogger Event is FREE so to learn more and to sign up, CLICK HERE! Remember the dates, as I will be announcing this AWESOME Giveaway for you!